This article was originally published by Clair Enlow on crosscut.com on February 22, 2018. The brick and terracotta building at Fifth Avenue and Marion Street — which once seemed destined for salvage hunters and the wrecking ball — has been beautifully restored. The Sanctuary at The Mark is its official name, but The Sanctuary will do. Welcome Seattle’s newest event venue — and the afterlife of Seattle’s historic First United Methodist Church building. It’s open for power partying. The Mark is the 650-foot-high, faceted glass and steel structure that now towers behind The Sanctuary on the same block. They’re joined at the foot. Together, this unlikely pair of buildings brings salvation to a piece of architectural history, and new life to an important city block. Workers are still scurrying around readying The Mark for grand openings of its lower hotel floors this summer. Its upper office floors will be ready for occupancy in April, according to developer Kevin Daniels. It’s been a long wait, particularly for preservationists who battled to save the home of a congregation at the center of Seattle history. Big names include pioneers David Blaine, Daniel Bagley and Arthur Denny. The church’s first country-Gothic home was replaced in 1907 by the current Byzantine-style structure, designed by James Hansen Schack Sr. and Daniel Riggs Huntington, prominent Seattle architects. A full-wall pipe organ was installed later. There was lots of preaching and speaking inside the old Sanctuary, which seated over a thousand. Now it will be filled with the low hubbub of well-dressed crowds, sometimes accompanied by a concert grand piano. Between events, there is overwhelming silence. It’s a light-washed, breathtaking space with a deep memory and a new floor. The old stained glass windows, whitish paint color, rich woodwork and terra cotta molding are all there, looking clean and pristine. But there’s irony, too. If you look back and upward toward the entrance you’ll see a giant halo overhead. It hangs over a chic little bar in the balcony. Wine magnums grace the windowsill of the bar, backed by the polished leaded glass of a colorful old window. It would be hard to guess which would horrify church fathers and mothers more: the bottles on the sill — or — the thought of their beloved sanctuary turned to rubble. For the last resident congregation that met there, rubble was the preferred option, given the impossible expense of restoration. Our church is not made of bricks, they said. Knock down the old building, and replace it with a mixed-use structure that includes a better ministry for the poor. Not so fast, said champions for preservation and others who loved the building, which was being used as a lecture and performance hall as well as a church. It belongs to the city. It’s a true landmark, they said. It reminds us who and where we are. “He stepped into a mess,” said architectural historian Michael Sean Sullivan, who consulted with Daniels on the project. Seattle had already been shocked by the 1992 wrecking of the historic Music Hall Theatre, and other losses. Historic churches in other cities were similarly threatened, and preservation of the First United Methodist Church building, the last of its kind in the center of Seattle, quickly became a national cause célèbre. It was one of the nation’s Most Endangered Historic Places, according to a list prepared by the National Trust for Historic Preservation. National support helped, but it didn’t get the project done. What made it pencil for Daniels is the rest of the half-block parcel, which had held a mid-century church activities building. It just happened to be big enough to replace with a tower alongside the church. Daniels approached the church with a proposal and won approval in 2007. He worked with architect ZGF to come up with a redevelopment plan. The great recession would come and go, delaying construction after a start in 2008, so that The Mark did not top out until 2016. The renovation of The Sanctuary didn’t begin until late in 2015. Daniels had taken on a big problem along with his property deal. The old church building had to be rebuilt in order to be saved. The century-old original structure, with bricks laid by the hands of church members, was cracked. And to meet modern seismic code, the walls had to be thickened from the inside with about 10 inches of steel and concrete. Done — even though every bit of original glass and interior woodwork and molding had to be removed, restored and put back into a slightly smaller space. Now it may be the safest place in town to be in a quake, according to Daniels, who puts the cost of the preservation effort at $40 million. The hardest preservation pill for him to swallow was the reinforcement of the huge dome over the sanctuary. It’s a long span, but because of its anciently derived geometry, it’s actually pretty stable, according to architectural historian Sullivan. In an earthquake, when a building like this becomes weightless in mid-shake, it’s the walls that crumble, not the dome, he said. But the city’s plan reviewers were nervous. To satisfy evolving city standards for bringing old structures up to modern code, it had to be reinforced with a specially formulated hard coating. “Like a 747,” Daniels said. Most of the magnificent full-wall pipe organ was shipped to a church in Oregon, with only a few pipes remaining for decoration. The restored concert grand, once belonging to the congregation and eventually found on Craigslist, now has a place of honor next to the silent organ wall. Next door in The Mark, five-star international hotel guests will bask in luxury in the lower floors, and the offices above will get power views. The mixed-use office and luxury hotel-in-a-tower is a dramatic counter to the weight of the historic money sink next door. According to Seattle architect Allyn Stellmacher, the tight site led directly to the faceted glass and steel geometry of the tower. The tower cants slightly away from its base into the air space over two historic structures: The Sanctuary and the Rainier Club, on the western half of the block. The relationship between The Mark and The Sanctuary is complicated. They’re joined through a ground-level atrium that envelops much of The Sanctuary’s historic brick and terra cotta exterior wall. Structural bracing leading to the tower above adds to the drama of the in-between space. In addition to serving as part of a passage between the old and new buildings, it will be used as a reception area for events in The Sanctuary. The Mark was designed by the Seattle office of ZGF architects, where Stellmacher works. 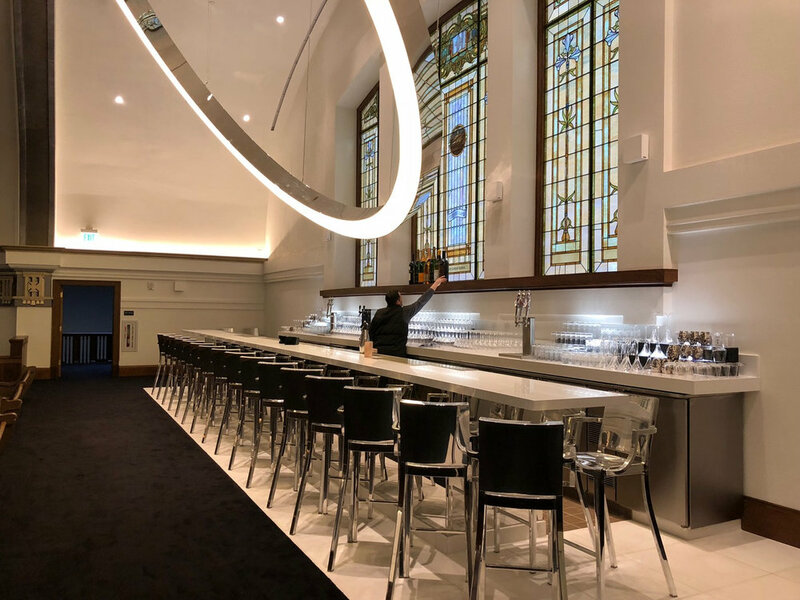 But the interiors of both buildings — all of the new hotel section in the tower and limited pieces of the retrofitted church building — are designed and branded by Paris-based Philippe Starck. Starck has reached out and touched Seattle history. As if in a literal time warp, a custom carpet — woven in a grand whorl of a pattern — stretches across the empty main floor of The Sanctuary. That floor used to be raked low but is now raised to one level. The Halo Bar above is also a Starck idea. Way below, the new ballroom under the raised floor is no church basement. It’s a party place filled with Starck imagery on the floors, walls and ceiling. But it’s in the guest rooms and meeting rooms next door in the tower where the designer takes over. The look is international hotel luxe: Room-sized showers and bathtubs with sweeping views. Carpet graphics branching through the rooms and halls. Views from the floor-to-ceiling canted glass of the outer walls are reflected in the many mirrors. Moveable, sculptural chairs seem to be scattered everywhere. In an homage to the Pacific Northwest, the dominant theme in Seattle’s new five-diamond hotel is the cut log. Arthur Denny, rest in peace.